US President Barack Obama has led global tributes to Lady Thatcher, saying the "world has lost one of the great champions of freedom and liberty". Juan Gabriel Valdes, a former minister in the Chilean government, has spoken of the close relationship between Margaret Thatcher and Augusto Pinochet. “She was never overly pre-occupied with the issue of human rights, but rather by what she perceived as the defence of freedom, which was basically a free market. Meanwhile, Argentina president Cristina Kirchner is reported to have stayed silent on Baroness Thatcher’s death. The leader of Argentina’s Falklands veterans said Thatcher had died “unpunished, without ever being judged”. 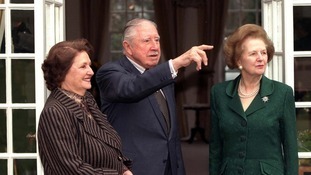 The son of Augusto Pinochet said the former Chilean dictator had a very good relationship with Margaret Thatcher because “she recognised his capacity to govern”. In the 1980s Margaret Thatcher strode onto the world stage alongside US President Ronald Reagan - who became a political and personal friend. Recognition of her importance as international leader was reflected in the warmth of today's transatlantic tributes. ITV News Washington Correspondent Robert Moore reports. I was saddened to learn of Baroness Thatcher's passing, and Teresa and I join millions across the United Kingdom and around the world in mourning her loss and celebrating her life. We pray especially for Carol and Mark and their families. The United States has lost a dear friend, and the world has lost a transformative leader who broke the glass ceiling in global politics. With her characteristic determination, she defined grit on the world stage and grace in the face of advancing age and illness. Lady Thatcher took the helm of government amid tumultuous times. She would face wars abroad, terrorism at home, and deep uncertainty about the United Kingdom's future. She met all these challenges and many others with unyielding drive and courage. We celebrate especially the way, with a hand outstretched across the Atlantic, Lady Thatcher strengthened the Special Relationship between the United States and the United Kingdom-a relationship that remains a driving force for freedom, justice, and democracy. In 1985, when I was a newly sworn Senator, Prime Minister Thatcher spoke to our Congress. The threat of a Soviet Empire she warned against has given way to a new set of global challenges, but our alliance with the United Kingdom remains an unrivaled source of strength in today's challenges from Afghanistan to Syria. Australian prime minister Julia Gillard praised Baroness Thatcher for her "strength of conviction". She said: "Her service as the first female prime minister of the United Kingdom was a history-making achievement. "Her strength of conviction was recognised by her closest supporters and her strongest opponents. "I extend my sincere condolences and those of my fellow Australians to her family and friends." Margaret Thatcher was a visionary, a warrior and a once-in-a-lifetime leader who left the world better than she found it. We'll miss her. Canadian Prime Minister Stephen Harper called Baroness Thatcher "a giant among leaders". The Canadian Conservative leader said: "While many in positions of power are defined by the times in which they govern, Margaret Thatcher had that rarest of abilities to herself personify and define the age in which she served. "Indeed, with the success of her economic policies, she defined contemporary conservatism itself. "In 2006 I met with her in London, where she provided me wise and gracious counsel, the memory of which I will forever cherish. Laureen (Mr Harper's wife) and I join all Canadians in saluting the proud life and legacy of Lady Thatcher." German Chancellor Angela Merkel praised Baroness Thatcher's actions in helping to bring about the end of the Cold War. She said: "As a long-serving prime minister, she shaped modern Britain as few have before or since. She was one of the greatest leaders in world politics of her time. "The freedom of the individual was at the centre of her beliefs so she recognised very early the power of the movements for freedom in Eastern Europe. And she supported them. I will never forget her contribution in overcoming Europe's partition and the end of the Cold War. "Margaret Thatcher was not a feminist but by proving herself as a woman in the highest democratic post when this was far from usual, she gave an example to many. My thoughts and sympathy are with her children." Reformist Soviet leader Mikhail Gorbachev said Baroness Thatcher was a "heavyweight politician". He said: "Thatcher was a politician whose word carried great weight. Our first meeting in 1984 set in train relations that were sometimes complicated, not always smooth, but which were serious and responsible on both sides. "Human relations also gradually took shape, becoming more and more friendly. In the end we managed to achieve a mutual understanding, and that contributed to a change in the atmosphere between our country and the West and the end of the Cold War. "Margaret Thatcher was a heavyweight politician and a striking person. She will remain in our memories, and in history." Former US President Bill Clinton said: "I was saddened to learn of the death of Lady Margaret Thatcher. The United Kingdom has lost its first woman Prime Minister, an iconic stateswoman, and a fearless leader. "The United States has lost one of its dearest friends and most valued allies. "Lady Thatcher understood that the special relationship which has long united our two nations is an indispensable foundation for peace and prosperity. Our strong partnership today is part of her legacy. "Like so many others, I respected the conviction and self-determination she displayed throughout her remarkable life as she broke barriers, defied expectations, and led her country. "Hillary, Chelsea, and I extend our condolences to her family and to the people of the United Kingdom."